Looking to maximize your efficiency? 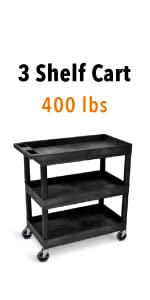 Tubster Heavy Duty Three Shelf Utility Tub Cart is for you. Transporting up to 500 pounds, there's almost no limit to what this utility cart can do! 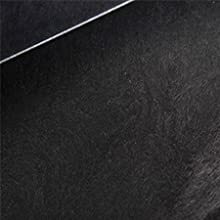 Perfect for warehouses, classrooms, home, and MORE! HEAVY DUTY DEEP TUBS: The Stand Steady Utility cart is made of HDPR (high-density polyethylene) shelves and PVC legs. It has extra deep 2.5” tubs with plenty of room to hold all of your tools, supplies, and more! Looking to maximize your efficiency? 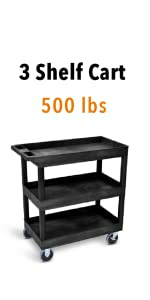 Tubster Heavy Duty Three Shelf Utility Tub Cart is for you. Transporting up to 500 pounds, there's almost no limit to what this utility cart can do! 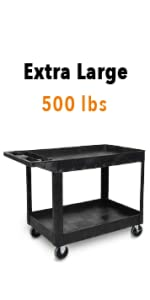 The Original Tubster Heavy Duty utility cart offers the same hardworking features as our standard Original Tubster 3 Shelf Tub Cart, but can hold even more weight – 500 pounds to be exact! The heavy-lifting power comes from 5" high quality caster wheels, which effortlessly roll across concrete, carpet, tile, and more! When you choose an Original Tubster utility cart, you choose amazing quality that lasts. Original Tubster utility carts are scratch, dent, rust, and stain resistant, and get even the toughest jobs done time and time again. Your satisfaction is our priority. Our friendly and knowledgable customer service team is here to help you choose the perfect cart for you, address any questions or concerns, and assist with anything else you may need. Our team is based in the USA, and that's where our products are made, too! Manufactured and assembled just outside of Chicago, all of our Original Tubsters are ready to roll with quick and easy domestic delivery! 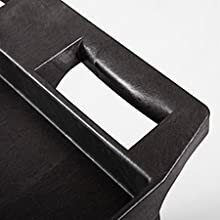 Overall Dimensions 35.25" x 18" x 36.25"
Shelf Dimensions 32" x 18"
Overall Dimensions 35.25" x 18" x 37.25"
Load up your cart with paper, tools, cleaning supplies and more; the possibilities are endless. Wherever you work, the Stand Steady Original Tubster is the perfect sidekick. Happy customers all over the country are using this cart in schools, warehouses, retails shops, and garages, just to name a few. Where will YOU put your Original Tubster to use? high-density polyethylene (HDPE) plastic shelves and sturdy PVC legs for years and years of rigorous use. Got 5-10 minutes? You've got your Tubster up and rolling! Simply attach the shelves and legs, then attach the wheels! 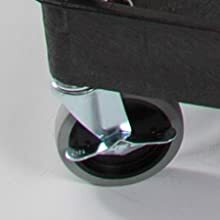 Ultra-smooth 5" casters glide effortlessly across cement, carpet, tile, and more! Plus, locking wheels stop your Tubster in its place when it's time to take a break. "The Tubster Heavy Duty cart is well made and the casters are excellent. 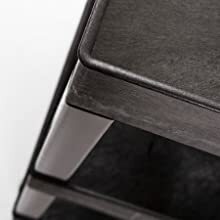 The material is a heavy duty plastic with 5" casters that roll amazingly well." "I bought this for my business because I wanted something that I could use to stack pots, pans, an some dinner plates. I'm so glad I went with this one." 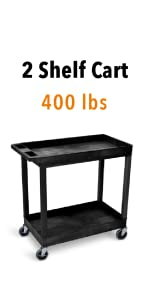 "I purchased this cart as a food serving cart for my church. 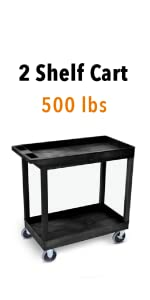 It's a nice heavy duty cart, and for the price you cant go wrong! Very easy to put together!"